Yesterday I met a crow who speaks English. I’d love to tell you what he said, but in my utter astonishment I forgot to actually listen. I’ve been thrilled about my pending internship at WildCare clinic in Bloomington since I first sent in my application over a year ago. My first impressions upon seeing the clinic in person yesterday were far from disappointing. I believe my first question was, “Do you get a lot of opossums?” The answer of “Oh yes” was like music to my ears. 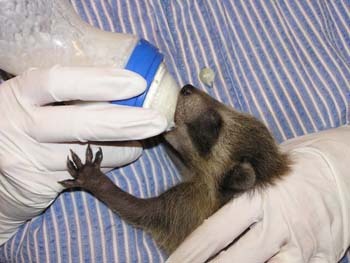 As WildCare’s latest Wildlife Intern, I was privy to an exclusive tour of the facilities. There are few animals at the clinic in the winter months, but I was able to get an idea of what I’m getting myself into. I got to meet the resident ambassadors, including DaVinci the talking crow, as well as a broad-winged hawk and a Eurasian barn owl. I also got to see several bats hibernating in their 20-gallon aquariums, huddled peacefully between glass and cloth. I must have looked like a kid in a candy shop as I was led through triage, the aviary room, the mammal room, the reptile room, the rabbit room, the raptor room, and many more rooms which combine to form something akin to my absolute dream house. Or dream clinic, rather. Dream internship? Most definitely. Come May 13th I may find myself doing anything from pushing paperwork to administering antibiotics to nursing baby fawns, incubating baby birds, feeding bats, fixing broken turtles, and making friends with a talking crow. Sounds about perfect, right? My only wish is that I have the time and energy left over to write and post photos of my experiences.